The “mother and child” theme is one Cassatt loved dearly, despite the fact that she never had any children of her own. She painted domestic scenes because, as a respectable woman, her world was confined to the indoors for the most part. But she had the edge on men in the Impressionist movement because just as she wasn’t allowed out of her domestic realm, the men weren’t really allowed in. So while Degas and all his buddies were painting prostitutes in their studios, Cassatt was painting her friends and maids. The results were very intimate and revolutionary paintings of the private sphere of mothers and children. And she did these very personal paintings without being creepy and voyeuristic (unlike another Impressionist we know…. *cough Degas cough*). This painting is inspired by Cassatt’s study of Japanese woodblock prints. The École des Beaux-Arts in Paris exhibited a series of such prints in 1890 and the Impressionists went nuts over them. We can see the Japanese inspiration in the designs in this painting. There are the stripes of the woman’s dress contrasted with the floral couch and the Oriental rug. It’s a bit clash-y but that’s beside the point. We can also see the Japanese inspiration in the point of view of the painting, which is from above. This vantage point implies that this is a private scene and that, in the powerful sentiment of Gretchen Wieners, we can’t sit with them. 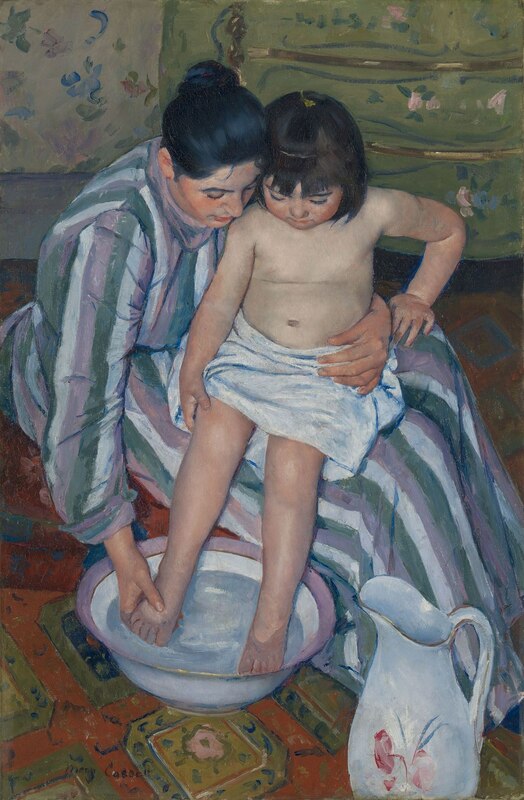 The Child's Bath (or The Bath) is an 1893 oil painting by American artist Mary Cassatt. The subject matter and the overhead perspective were inspired by Japanese woodblocks. It shows dignity in motherhood and has a style similar to that of Degas. The Art Institute of Chicago acquired the piece in 1910. It has since become one of the most popular pieces in the museum. In 1891, Mary Cassatt created the oil painting with two subjects, a mother figure and a young child. The genre scene is based on the everyday bathing of a child, a moment that is "special by not being special". The female figure holds up the child firmly and protectively with her left hand while the other hand carefully washes the child’s feet. The small and chubby left arm of the child braces against the mother’s thigh, while the other hand is clamped firmly on the child’s own thigh. The mother’s right hand presses firmly but still gently on the foot in the basin, mimicking the child’s own pressure on her thigh. To indicate depth, Cassatt painted the faces to recede into space. The paint strokes are layered and rough, creating thick lines that outline the figures and stand them out from the patterned background. The hand of the artist is evident through the roughness of the strokes and can be better viewed from a distance. Check out the full Wikipedia article about The Child's Bath.